Its been a while – 2013 is here and the Cronk family grows larger! Been ages since I last posted and suspect it will be while before I post again – new job, kids and the fact that twitter is easier! Have added a Strava widget to the right as have now seriously got into road cycling – have signed up for a few sportives this year including a 127 miler! Cronk family is now bigger with the addition of our son Alfie. Just about to start a new job in a new industry sector which is exciting. Good – Yahama RVX473 amp – amazing bit of Hi-Fi / Home Cinema kit, particularly paired with Boston Accoustics speakers. Very much enjoying this – in particularly the Airplay feature and the Smartphone and tablet apps which let you remote control it over Wifi! Bad – Not much to report on this front. Still remain a bit unconvinced by Windows 8 – think it makes most sense if you have a touchscreen / tablet type device (HP Envy looks interesting). Ugly – Am I the only one that thinks the front of the BMW 1 series looks horrible? Windows 8 will drop the start menu – is this the beginning of the end for MS OS dominance? I think this is a silly move – surely one of the things that keep people tied to Windows is the fact that they know how to use it. If they (badly) copy Mac / Linux and force people to re-learn how to navigate the OS won’t more people just switch to Mac/iPad and Linux? Especially given Android’s recent successes, and the continuing Apple obsession? I hope for MS sakes they keep an option in to make the OS look like Windows 7 – eg a basic theme? 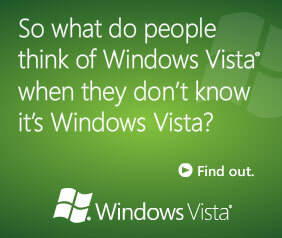 Does this kind of advertising mean Vista is in trouble? I am often asked for purchasing advice on laptops and Sony is often my response – mainly on reputation as I have never owned one until now. People often say with a Sony you are paying the brand name – whilst this is true to a degree I also think you are paying for R&D and build quality. This certainly comes through with the Sony SZ3 – a well thought out compact & light but powerful notebook. The SZ3HP is the entry level machine – with a slightly lower spec than that of the top of the line models mainly in processor and memory terms. I couldn’t justify spending much over the £1K mark and didn’t feel you got much more for quite a bit more money. The higher spec model is a different colour and has a fingerprint scanner, is marginally lighter with a thiner screen – quite how they can make it thinner than mine is beyond belief! Dual Performance modes “Stamina” and “Speed” – with a switch to change between – requiring a reboot to changeover – this mainly changes between the Nvidia graphics and the on board Intel graphics. Performance – both in speed and usability – for example the screen is excellent. Design and looks – never fails to get comments from people – as it is a very nice looking machine! – Lack of a physical volume control or mute button like I had on the Omnibook. As it can be annoying when you realise you’ve just booted the thing up on the train and the Windows startup sound is about to play full volume! The only way of changing the volume is via the Fn+F4 and F5 keys which don’t work until your in Windows! I have just discovered you can assign muting to the S1 button – but this can be a bit flaky. Initially it took a while to get used to the keyboard – as it was quite different the HP – the keys are bigger (strangely for a smaller machine!) and surprisingly there is a bit of flex in the keyboard – but I don’t really notice now I’ve been using it for a while. I got on better with the trackpad better than I was expecting (it better than most of the trackpads I’ve used before) to although on occasions I do miss the trackpoint (IBM Thinkpad stick style mouse) that the HP has. I use it in the Speed mode most of the time (apart from on really long journeys) as that gives well over an hour of battery life with good performance. I have managed to get over 5 hours out of the machine in Stamina though (on a trip back from France) using it mainly to read some documents, but also some image editing in Photoshop. In terms of performance the machine has amazed me – dual core really is impressive – unfortunately with Windows I suspect that 1 core is used to power Windows and its inefficiencies and the other for your applications! 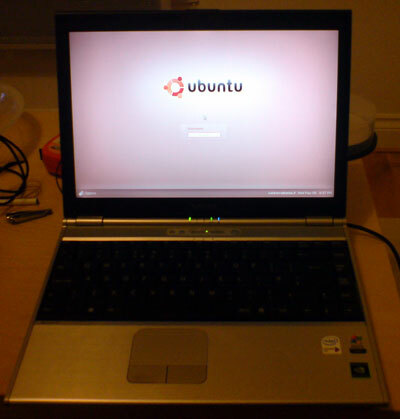 It certainly runs a lot cooler and quieter whilst doing nothing on Linux than on Vista! The application that my desktop has been struggling with – Adobe Premiere Elements – runs well – again I think Dual core helps here. Haven’t played many games apart from a short spell with Secondlife (which I gave up after a few hours – after realising I just don’t have time for games anymore!) which worked better than I expected – the nVidia graphics chip is pretty good. More to follow when I can remember them / they annoy me again! * As it turns out I am no longer doing that commute, but its useful having a truely portable notebook and as I plan to cycle commute the light weight and small size will come in handy! Almost £1000 for Vista and Office Ultimate – what a bargain! I think £777.46 is expensive enough – but it illustrates quite how much (£969.98) you could Spend on just Windows and Office with Microsoft! I was amazed so thought I’d share! I doubted the usability of Open Office until a few months ago – when I installed it on my parents new PC – they said that they haven’t really noticed the difference! They also said “how can they get away with doing this? Its exactly like MS Office!” Looks like MS might be trying to address that with its recent patent rumblings then! I like to move the My Documents folder on each of my machines from the C: drive to a network share that lives on my Linux file server – on my laptop I make that available offline – in case I am away from home etc. On Windows XP this was fine and worked pretty well. I recently upgraded to Vista and mapped the drive for my home directory – all good made it available offline (or “Always available offline” as Vista now calls it). It did its initial sync and all was good. Next time I logon (and after making sure I am connected to the network) I go back to my network drive to make sure its working online – and nope it isn’t! I make sure I can ping the machine – thats okay and I can access the share online if I access the machine by its ip – \\192.168.1.4\share. Very weird and very frustrating! Whilst searching for the solution I came across some useful info on making sure Samba is setup correctly for offline files (mainly to do with oplocks – see below for a useful link). Anyway tonight I have a brain wave whilst looking at Vista’s user management stuff and reading some more stuff on the net. It turns out that Vista’s offline files works per user rather than per share and as a result is more reliant on usernames and passwords. My Samba share uses a different password to my vista login. So I made them the same – and hey presto it works! So in summary if using offline files in Vista make sure your usernames and passwords match. I also think I’ve seen something under the user accounts section that lets you link in different user account details – but I haven’t tried that yet. Here is a screenshot.